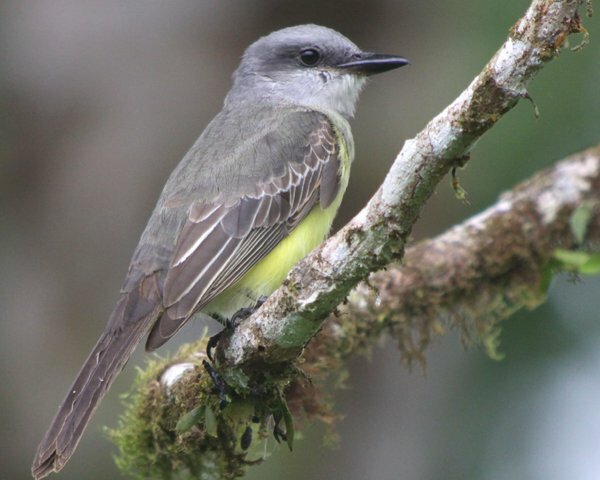 The Chocó region of northwestern Ecuador and western Columbia has many endemic species, as Mike already let you know back in January. While we Queens birders in Ecuador did not spend much time at a low enough elevation to see many of the Chocó endemics we did see a few. 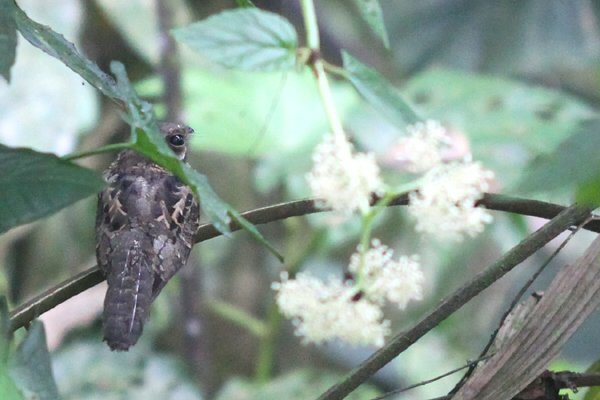 And the day that started out with us birding at Rio Silanche Bird Sanctuary and finishing up at Reserva Mangaloma gave us a shot at some Chocó species that we really wanted to see. Of course, before we could bird Reserva Mangaloma we needed to stop for some food, which we did at a small restaurant at a town between the reserves (where we added Black-cheeked Woodpecker to our trip list). Refueled, re-energized, and raring to go, we piled back in the van and made our way to Reserva Mangaloma. On the long dirt entrance road to the preserve we spotted several new species for our trip, not least of which was the Masked Water-tyrant in the above photo. 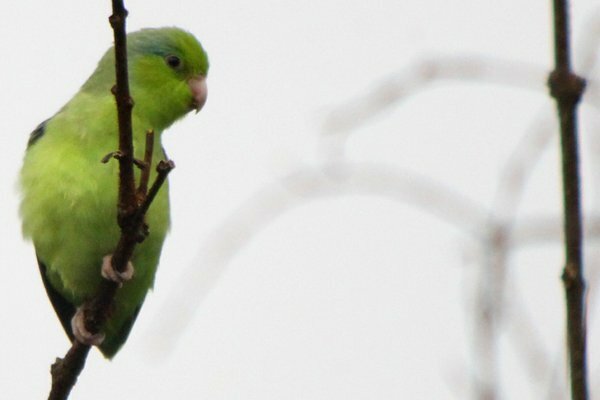 We also saw only the second parrot species for the trip that we managed to identify, the adorable and entertaining Pacific Parrotlet, which were much nicer in the wild than how most people see them, which is in a cage. Once we were in the actual reserve we were rather pleased with the birds visible without us even having to make our way down the trails. The Bay-headed Tanager below, which is much more gorgeous than its name or the image shows, was foraging in the open and the Tropical Kingbird beneath it was even more cooperative. We eventually made our way onto a trail that had only recently been hacked out of the habitat so it was a little bit rough but well worth the effort. A wide array of species crossed our paths and were ticked from our checklists. Streak-headed Woodcreeper? Check. Red-rumped Woodpecker? Check. Ecuadorian Thrush? Check. Purple Honeycreeper? Check. You get the idea: we saw lots of birds! One of my favorites was a nightjar that flushed from the path and sat briefly, almost completely unobscured. Sure, you lucky birders who have visited Texas all have seen this species already but I as thrilled with my life Common Pauraque! As cool as a life nightjar, and perhaps even cooler, was our second motmot of the trip, a Broad-billed Motmot, which is not as easy to distinguish from Rufous Motmot as I would have thought. 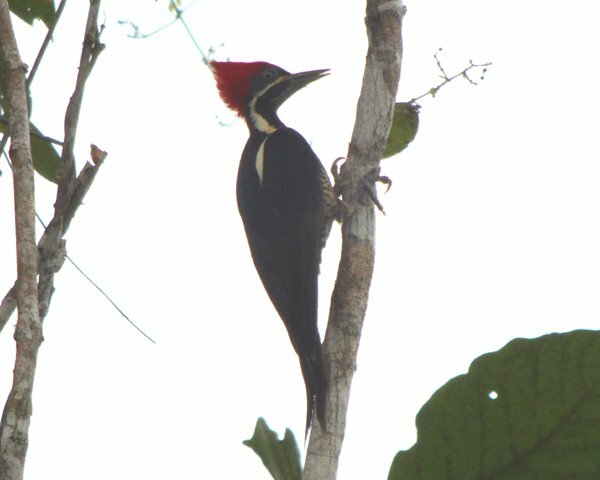 The shape of the black patch on the face is not as distinctively different as it looks in The Birds of Ecuador, and one is better off using other field marks like the barely-distinguishable-in-this-lousy-picture bluish patch on the throat and the spot at which the rufous chest gives way to the blue-green belly. There were still more birds to come, especially on a couple of trees that were swarming with mostly tanagers, but other species as well. We were fortunate enough to spot a pair of Orange-fronted Barbets, a Chocó endemic, one of which is below. All-in-all it was a heck of a visit to Reserva Mangaloma. It was made even better when we found out that our observation of Slaty Becard was a first for the reserve. And then it was made even better when, on the way out, Arie spotted a White-whiskered Puffbird through the windshield, our one and only puffbird for the trip. And then it was made even even better better when we spotted a Laughing Falcon perched up on the side of the road a bit further down. And I was made even happier when, upon our return to Mindo, we spotted the Common Potoo where we were lodging at Yellow House. My second life nightjar of the day! What a day’s birding! I’m impressed that you got shots of that many of your special birds. Love the paraque and that adorable Pacific parrotlet. Knowing how they bomb around, I’m doubly impressed.